Gigabyte has announced that most of its motherboards, including the 100 series, are compatible with Windows 10. PC hardware manufacturer, Gigabyte has announced that most of its motherboards, including the 100 series motherboards, are compatible with Windows 10. On the Intel platform, Z170, X99, X97, H97, Z87, Q87, B85, H87, H81, X79, H61, and Bay Trail-D motherboards are compatible with Windows 10. On the AMD side, 990FX, 990X, 970, A88X, A78, A75, A68H, A58, A55, AM1, and Kabini motherboards are compatible with the latest Windows operating system. GIGABYTE TECHNOLOGY Co. Ltd, a leading manufacturer of motherboards and graphics cards, today announced that many of its motherboards including its 100 series boards, the Intel X99, Z97 and H97 boards as well as its AMD 990FX, 990X and 970 based motherboards are ready to support Microsoft’s Windows 10. For a full list of compatible motherboards please visit this page. GIGABYTE’s engineers have worked hard to ensure that the drivers and BIOS on all current GIGABYTE motherboards are ready and optimized for Windows 10. GIGABYTE Ultra Durable Motherboards are known for their world renowned longevity, meaning users can be sure that older motherboards work well in this new OS environment. 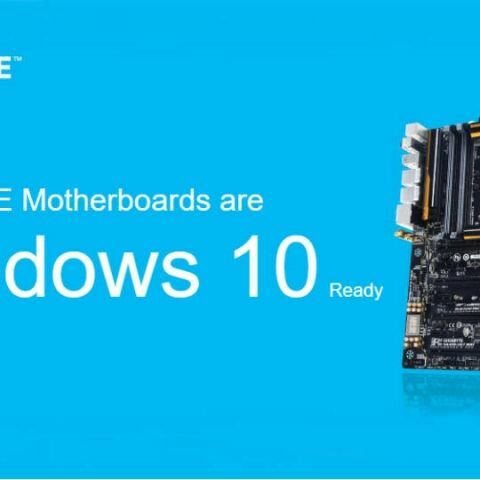 GIGABYTE motherboards are the ideal platform for Windows 10 on the desktop. Windows 10 is the most innovative operating system yet from Microsoft. It has dozens of new and exciting features to improve productivity and gaming, including full support for DirectX 12. Windows 10 is available now from retailers and through direct download from the Windows Store. Note: Some advanced Windows 10™ features require optimized specifications such as a touch screen monitor, a UEFI BIOS, and an SSD that may not be available in every legacy and entry-level system.